Dickens' Holiday classic gets a modern makeover in this hilarious (but still heartwarming!) update of one of the world's best-loved stories. Ebb Scrooge is a modern American businessman, a cold fish with a cold heart and no great love for Christmas, until one fateful Christmas Eve when his past, present and future come calling. Seeing himself as others see him is a powerful antidote to his curmudgeonly ways, and by the end of the night, he'll have a whole new outlook on the meaning of the Holiday. 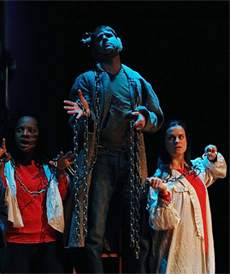 All of the well-known characters from the Dickens' story are here on stage, but spun into modern incarnations, with jokes that will entertain kids from 1 to 92. Fast-paced and fun, this production is used by some schools' Language Arts departments as a living example of free-adaptation. Others simply book it as a holiday treat. In any case, book it fast, because available dates have a tendency to get filled quickly!